The War in Afghanistan (or the U.S. War in Afghanistan), code named Operation Enduring Freedom – Afghanistan (2001–14) and Operation Freedom's Sentinel (2015–present), followed the United States invasion of Afghanistan of 7 October 2001. The U.S. was initially supported by the United Kingdom, Canada, and Australia and later by a coalition of over 40 countries, including all NATO members. The war's public aims were to dismantle al-Qaeda and to deny it a safe base of operations in Afghanistan by removing the Taliban from power. Since the initial objectives were completed at the end of 2001, the war mostly involves U.S. and allied Afghan government troops battling Taliban insurgents. The War in Afghanistan is the longest war in U.S. history. Following the September 11 attacks in 2001 on the U.S., which President George W. Bush blamed on Osama bin Laden who was living or hiding in Afghanistan and had already been wanted since 1998, President Bush demanded that the Taliban, who were de facto ruling the country, hand over bin Laden. The Taliban declined to extradite him unless they were provided clear evidence of his involvement in the attacks, which the U.S. dismissed as a delaying tactic and then on 7 October 2001 launched Operation Enduring Freedom with the United Kingdom. The two were later joined by other forces, including the Northern Alliance – the Afghan opposition which had been fighting the Taliban in the ongoing civil war since 1996. By December 2001, the Taliban and their al-Qaeda allies were mostly defeated in the country, and at the Bonn Conference new Afghan interim authorities (mostly from the Northern Alliance) elected Hamid Karzai to head the Afghan Interim Administration. The United Nations Security Council established the International Security Assistance Force (ISAF) to assist the new authority with securing Kabul, which after a 2002 loya jirga (grand assembly) became the Afghan Transitional Administration. A nationwide rebuilding effort was also made following the end of the totalitarian Taliban regime. In the popular elections of 2004, Karzai was elected president of the country, now named the Islamic Republic of Afghanistan. NATO became involved in ISAF in August 2003, and later that year assumed leadership of it. At this stage, ISAF included troops from 43 countries with NATO members providing the majority of the force. One portion of U.S. forces in Afghanistan operated under NATO command; the rest remained under direct U.S. command. Following defeat in the initial invasion, the Taliban was reorganized by its leader Mullah Omar, and launched an insurgency against the Afghan government and ISAF in 2003. Though outgunned and outnumbered, insurgents from the Taliban (and its ally Haqqani Network) - and to a lesser extent Hezb-e-Islami Gulbuddin and other groups - waged asymmetric warfare with guerrilla raids and ambushes in the countryside, suicide attacks against urban targets, and turncoat killings against coalition forces. The Taliban exploited weaknesses in the Afghan government to reassert influence across rural areas of southern and eastern Afghanistan. From 2006 the Taliban made significant gains and showed an increased willingness to commit atrocities against civilians – ISAF responded by increasing troops for counter-insurgency operations to "clear and hold" villages. Violence sharply escalated from 2007 to 2009. Troop numbers began to surge in 2009 and continued to increase through 2011 when roughly 140,000 foreign troops operated under ISAF and U.S. command in Afghanistan. Of these 100,000 were from the U.S. On 1 May 2011, United States Navy SEALs killed Osama bin Laden in Abbotabad, Pakistan. NATO leaders in 2012 commended an exit strategy for withdrawing their forces, and later the United States announced that its major combat operations would end in December 2014, leaving a residual force in the country. In October 2014, British forces handed over the last bases in Helmand to the Afghan military, officially ending their combat operations in the war. On 28 December 2014, NATO formally ended ISAF combat operations in Afghanistan and officially transferred full security responsibility to the Afghan government. The NATO-led Operation Resolute Support was formed the same day as a successor to ISAF. As of May 2017, over 13,000 foreign troops remain in Afghanistan without any formal plans to withdraw, and continue their fight against the Taliban, which remains by far the largest single group fighting against the Afghan government and foreign troops. Tens of thousands of people have been killed in the war. Over 4,000 ISAF soldiers and civilian contractors, over 62,000 Afghan national security forces were killed, as well as over 31,000 civilians and even more Taliban. The entry of Soviet forces in Afghanistan in December 1979 prompted its Cold War rivals, the United States, Pakistan, Saudi Arabia and China to support rebels fighting against the Soviet-backed Democratic Republic of Afghanistan. In contrast to the secular and socialist government, which controlled the cities, religiously motivated mujahideen held sway in much of the countryside. Beside Rabbani, Hekmatyar, and Khan, other mujahideen commanders included Jalaluddin Haqqani. The CIA worked closely with Pakistan's Inter-Service Intelligence to funnel foreign support for the mujahideen. The war also attracted Arab volunteers, known as "Afghan Arabs", including Osama bin Laden. In 1992, Rabbani officially became president of the Islamic State of Afghanistan, but had to battle other warlords for control of Kabul. In late 1994, Rabbani's defense minister, Ahmad Shah Massoud, defeated Hekmatyar in Kabul and ended ongoing bombardment of the capital. Massoud tried to initiate a nationwide political process with the goal of national consolidation. Other warlords, including Ismail Khan in the west and Dostum in the north, maintained their fiefdoms. In 1994, Mohammed Omar, a mujahideen member who taught at a Pakistani madrassa, returned to Kandahar and formed the Taliban movement. His followers were religious students, known as the Talib and they sought to end warlordism through strict adherence to Islamic law. By November 1994, the Taliban had captured all of Kandahar Province. They declined the government's offer to join in a coalition government and marched on Kabul in 1995. The Taliban's early victories in 1994 were followed by a series of costly defeats. Pakistan provided strong support to the Taliban. Analysts such as Amin Saikal described the group as developing into a proxy force for Pakistan's regional interests, which the Taliban denied. The Taliban started shelling Kabul in early 1995, but were driven back by Massoud. Massoud and Dostum, former arch-enemies, created a United Front against the Taliban, commonly known as the Northern Alliance. In addition to Massoud's Tajik force and Dostum's Uzbeks, the United Front included Hazara factions and Pashtun forces under the leadership of commanders such as Abdul Haq and Haji Abdul Qadir. Abdul Haq also gathered a limited number of defecting Pashtun Taliban. Both agreed to work together with the exiled Afghan king Zahir Shah. International officials who met with representatives of the new alliance, which the journalist Steve Coll referred to as the "grand Pashtun-Tajik alliance", said, "It's crazy that you have this today … Pashtuns, Tajiks, Uzbeks, Hazara … They were all ready to buy in to the process … to work under the king's banner for an ethnically balanced Afghanistan." The Northern Alliance received varying degrees of support from Russia, Iran, Tajikistan and India. The Taliban captured Mazar-i-Sharif in 1998 and drove Dostum into exile. The conflict was brutal. According to the United Nations (UN), the Taliban, while trying to consolidate control over northern and western Afghanistan, committed systematic massacres against civilians. UN officials stated that there had been "15 massacres" between 1996 and 2001. The Taliban especially targeted the Shia Hazaras. In retaliation for the execution of 3,000 Taliban prisoners by Uzbek general Abdul Malik Pahlawan in 1997, the Taliban executed about 4,000 civilians after taking Mazar-i-Sharif in 1998. Bin Laden's 055 Brigade was responsible for mass killings of Afghan civilians. The report by the United Nations quotes eyewitnesses in many villages describing "Arab fighters carrying long knives used for slitting throats and skinning people". By 2001, the Taliban controlled as much as 90% of Afghanistan, with the Northern Alliance confined to the country's northeast corner. Fighting alongside Taliban forces were some 28,000–30,000 Pakistanis (usually also Pashtun) and 2,000–3,000 Al-Qaeda militants. Many of the Pakistanis were recruited from madrassas. A 1998 document by the U.S. State Department confirmed that "20–40 percent of [regular] Taliban soldiers are Pakistani." The document said that many of the parents of those Pakistani nationals "know nothing regarding their child's military involvement with the Taliban until their bodies are brought back to Pakistan". According to the U.S. State Department report and reports by Human Rights Watch, other Pakistani nationals fighting in Afghanistan were regular soldiers, especially from the Frontier Corps, but also from the Pakistani Army providing direct combat support. In August 1996, Bin Laden was forced to leave Sudan and arrived in Jalalabad, Afghanistan. He had founded Al-Qaeda in the late 1980s to support the Mujahideen's war against the Soviets, but became disillusioned by infighting among warlords. He grew close to Mullah Omar and moved Al-Qaeda's operations to eastern Afghanistan. The 9/11 Commission in the U.S. found that under the Taliban, al-Qaeda was able to use Afghanistan as a place to train and indoctrinate fighters, import weapons, coordinate with other jihadists, and plot terrorist actions. While al-Qaeda maintained its own camps in Afghanistan, it also supported training camps of other organizations. An estimated 10,000 to 20,000 men passed through these facilities before 9/11, most of whom were sent to fight for the Taliban against the United Front. A smaller number were inducted into al-Qaeda. U.S. policy toward Afghanistan changed after the 1998 U.S. embassy bombings. Subsequently, Osama bin Laden was indicted for his involvement in the embassy bombings. In 1999 both the U.S. and the United Nations enacted sanctions against the Taliban via United Nations Security Council Resolution 1267, which demanded the Taliban surrender Osama bin Laden for trial in the U.S. and close all terrorist bases in Afghanistan. The only collaboration between Massoud and the U.S. at the time was an effort with the CIA to trace bin Laden following the 1998 bombings. The U.S. and the European Union provided no support to Massoud for the fight against the Taliban. A change in U.S. policy was effected in August 2001. The Bush administration agreed on a plan to start supporting Massoud. A meeting of top national security officials agreed that the Taliban would be presented with an ultimatum to hand over bin Laden and other al-Qaeda operatives. If the Taliban refused, the U.S. would provide covert military aid to anti-Taliban groups. If both those options failed, "the deputies agreed that the United States would seek to overthrow the Taliban regime through more direct action." In late 2000, Ahmad Shah Massoud, a Tajik nationalist and leader of the Northern Alliance, invited several other prominent Afghan tribal leaders to a jirga in northern Afghanistan "to settle political turmoil in Afghanistan". Among those in attendance were Pashtun nationalists, Abdul Haq and Hamid Karzai. In early 2001, Massoud and several other Afghan leaders addressed the European Parliament in Brussels, asking the international community to provide humanitarian help. The Afghan envoy asserted that the Taliban and al-Qaeda had introduced "a very wrong perception of Islam" and that without the support of Pakistan and Osama bin Laden, the Taliban would not be able to sustain their military campaign for another year. Massoud warned that his intelligence had gathered information about an imminent, large-scale attack on U.S. soil. On 9 September 2001, two French-speaking Algerians posing as journalists killed Massoud in a suicide attack in Takhar Province of Afghanistan. The two perpetrators were later alleged to be members of al-Qaeda. They were interviewing Massoud before detonating a bomb hidden in their video camera. Both of the alleged al-Qaeda men were subsequently killed by Massoud's guards. Planning resumed in 2002. Construction began in Turkmenistan in 2015 and Afghanistan in February 2018. 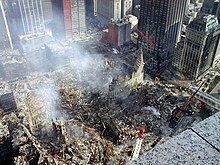 On the morning of 11 September 2001, a total of 19 Arab men—15 of whom were from Saudi Arabia—carried out four coordinated attacks in the United States. Four commercial passenger jet airliners were hijacked. The hijackers – members of al-Qaeda's Hamburg cell – intentionally crashed two of the airliners into the Twin Towers of the World Trade Center in New York City, killing everyone on board and more than 2,000 people in the buildings. Both buildings collapsed within two hours from damage related to the crashes, destroying nearby buildings and damaging others. The hijackers crashed a third airliner into the Pentagon in Arlington, Virginia, just outside Washington, D.C. The fourth plane crashed into a field near Shanksville, in rural Pennsylvania, after some of its passengers and flight crew attempted to retake control of the plane, which the hijackers had redirected toward Washington, D.C., to target the White House, or the U.S. Capitol. No one aboard the flights survived. According to the New York State Health Department, the death toll among responders including firefighters and police was 836 as of June 2009. Total deaths were 2,996, including the 19 hijackers. The Taliban publicly condemned the September 11 attacks. U.S. President George W. Bush issued an ultimatum to the Taliban to hand over Osama bin Laden, "close immediately every terrorist training camp, hand over every terrorist and their supporters, and give the United States full access to terrorist training camps for inspection." Osama bin Laden was protected by the traditional Pashtun laws of hospitality. In the weeks ahead and at the beginning of the US and NATO invasion of Afghanistan, the Taliban demanded evidence of bin Laden's guilt, and subsequently offered to hand over Osama bin Laden. US President, George W. Bush, rejected the offer, citing policies such as "we do not negotiate with terrorists." Britain's then deputy prime minister, John Prescott, claimed the group's expressions amount to an admission of guilt for the September 11 attacks. After the US invasion, the Taliban repeatedly requested for due diligence investigation and willingness to handover Osama to a third country for due prosecutions. The US refused and continued bombardments of Kabul airport and other cities. Haji Abdul Kabir, the third most powerful figure in the ruling Taliban regime, told reporters: "If the Taliban is given evidence that Osama bin Laden is involved, we would be ready to hand him over to a third country." At an 15 October 2001 meeting in Islamabad, Wakil Ahmed Muttawakil, the foreign minister of Afghanistan, offered to remove Osama bin Laden to the custody of the Organisation of Islamic Cooperation (OIC) to be tried for the 9/11 terror attacks. The OIC is a large organization of 57 member states. Muttawakil by this point had dropped the condition that the U.S. furnish evidence of Osama bin Laden's involvement in the 9/11 attacks as a precondition for the transfer of Osama bin Laden by Afghanistan to the OIC for trial. The refusal of the US to provide evidence of bin Laden's involvement in the September 11 attacks contributed to the suspicion that the US-led invasion may have been motivated more by the desire for a Trans-Afghanistan Pipeline than bin Laden and terrorism. In January 2018, the BBC reported that the Taliban are openly active in 70% of the country (being in full control of 14 districts and have an active and open physical presence in a further 263) and that Islamic State is more active in the country than ever before. Following attacks by the Taliban and Islamic State that killed scores of civilians, President Trump and Afghan officials decided to rule out any talks with the Taliban. On 15 February 2018, The New York Times reported the rise of Afghan civilians being intentionally targeted by the Taliban, based on an annual United Nations report released a week earlier. This report offered a detailed assessment of the 16 year Afghan war, showing the rise of complex bombing attacks deliberately targeting civilians in 2017, having 10,453 Afghan civilians wounded or killed. As the US and Afghan government are publishing fewer statistics, the UN report is one of the most reliable indicators about the war's impact by 2018. The report emphasizes the rise of "complex attacks", a type of suicide assault that is becoming more deadly, described by the New York Times as the hallmark of the war in 2018. These attacks are referred to as the Taliban's ferocious response to US President Trump's new strategy of war (an increased pace of aerial bombardments targeting Taliban and Islamic State Militants), giving the message that the Taliban can strike at will, even in the capital city, Kabul. The UN report included a statement showing the Taliban's position, the Taliban blamed the U.S and its allies for fighting war in Afghanistan, and it denied targeting civilians. The New York Times quoted Atiqullah Amarkhel, a retired general and military analyst based in Kabul, saying that the UN report proved the failure of peace talks, as the Taliban and the US government are both determined for victory rather than negotiating settlement. He said "More airstrikes mean more suicide attacks," proving the intensification of the war by 2018. In August 2018, Erik Prince, founder and former head of the Blackwater private security firm, said that the war could be ended by privatization. However, the US Defense Secretary James Mattis rebuked the idea, saying, “When Americans put their nation's credibility on the line, privatizing it is probably not a wise idea.” The US war in Afghanistan turned 17 in October 2018. On 17 October 2018, days before parliamentary election, Abdul Jabar Qahraman, an election candidate was killed in an attack by Taliban. The Taliban issued a statement, warning teachers and students to not participate in the upcoming elections or use schools as polling centers. On 25 January 2019, Afghanistan's president Ashraf Ghani said that more than 45,000 members of the Afghan security forces had been killed since he became president in 2014. He also said that there had been less than 72 international casualties during the same period. On 4 February 2019, Taliban attacked a checkpoint in northern Baghlan province. 21 people, including 11 policemen were killed. Same day, another attack took place in northern Samangan province that killed 10 people. 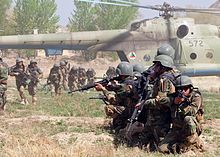 On 1 March 2019, the Taliban led an assault against Shorab military base, in Helmand, killing 23 security forces and wounding 20. According to the Watson Institute for International Studies Costs of War Project, roughly 31,000 civilians had been killed as a result of the war up to the middle of 2016. A report titled Body Count put together by Physicians for Social Responsibility, Physicians for Global Survival and the Nobel Peace Prize-winning International Physicians for the Prevention of Nuclear War (IPPNW) concluded that 106,000–170,000 civilians have been killed as a result of the fighting in Afghanistan at the hands of all parties to the conflict. A UN report over the year 2009 stated that, of the 1,500 civilians having died from January until the end of August 2009, 70% were blamed on "anti-government elements". The US website of The Weekly Standard stated in 2010, referring to a UN Report, that 76% of civilian deaths in Afghanistan over the past year had been "caused by the Taliban". That is a misquotation of the UNAMA Report, which does not attribute numbers of deaths directly to the Taliban, but to "anti-government elements" (AGE) and to "pro-government forces" (PGF). Over the period January until June 2010, indeed the report published in August 2010 stated that, of all 3,268 civilian casualties (dead or wounded), 2,477 casualties (76%) were caused by AGE, 386 caused by PGF (11%). Over the whole of 2010, with a total of 2,777 civilians killed, the UN reported 2,080 civilian deaths caused by "anti-government elements" (75%), "pro-government forces" caused 440 deaths, and 257 deaths "could not be attributed to any party". In July 2011, a UN report said "1,462 non-combatants died" in the first six months of 2011 (insurgents 80%). In 2011 a record 3,021 civilians were killed, the fifth successive annual rise. According to a UN report, in 2013 there were 2,959 civilian deaths with 74% being blamed on anti-government forces, 8% on Afghan security forces, 3% on ISAF forces, 10% to ground engagements between anti-Government forces and pro-Government forces and 5% of the deaths were unattributed. 60% of Afghans have direct personal experience and most others report suffering a range of hardships. 96% have been affected either personally or from the wider consequences. In 2015, according to the United Nations (UN) annual report there were 3,545 civilian deaths and 7,457 people wounded. The anti-government elements were responsible for 62 percent of the civilians killed or wounded. The pro-government forces caused 17 percent of civilian deaths and injuries – including United States and NATO troops, which were responsible for about 2 percent of the casualties. In 2016, a total of 3,498 civilians deaths and 7,920 injuries were recorded by the United Nations. The UN attributed 61% of casualties to anti-government forces. Afghan security forces caused about 20 percent of the overall casualties, while pro-government militias and Resolute Support Mission caused 2 percent each. Air strikes by US and NATO warplanes resulted in at least 127 civilian deaths and 108 injuries. While, the Afghan air force accounted for at least 85 deaths and 167 injuries. The UN was not able to attribute responsibility for the remaining 38 deaths and 65 injuries resulting from air strikes. During the parliamentary elections on 20 October 2018, several explosions targeting the polling stations took place. At least 36 people were killed and 130 were injured. Previously, ten election candidates were killed during the campaigning by the Taliban and the Islamic State group. On 28 December 2018 a report issued by UNICEF revealed that during the first nine months of 2018, five thousand children were killed or injured in Afghanistan. Manuel Fontaine UNICEF Director of Emergency Programs said the world has forgotten children living in conflict zones. According to the Human Rights Watch, more than 10,000 civilians were killed or wounded during 2018, out of which one third were children. Reportedly, innumerous deadly attacks were carried out in urban areas by insurgents. Airstrikes and night raids by the US and Afghan forces also caused heavy civilian casualties. Afghans who interpreted for the British army have been tortured and killed in Afghanistan, including their families. As of May 2018 the UK government has not resettled any interpreter or family member in the UK. From 1996 to 1999, the Taliban controlled 96% of Afghanistan's poppy fields and made opium its largest source of revenue. Taxes on opium exports became one of the mainstays of Taliban income. According to Rashid, "drug money funded the weapons, ammunition and fuel for the war." In The New York Times, the Finance Minister of the United Front, Wahidullah Sabawoon, declared the Taliban had no annual budget but that they "appeared to spend U.S.$300 million a year, nearly all of it on war". He added that the Taliban had come to increasingly rely on three sources of money: "poppy, the Pakistanis and bin Laden". By 2000 Afghanistan accounted for an estimated 75% of the world's opium supply and in 2000 produced an estimated 3276 tonnes from 82,171 hectares (203,050 acres). Omar then banned opium cultivation and production dropped to an estimated 74 metric tonnes from 1,685 hectares (4,160 acres). Some observers say the ban – which came in a bid for international recognition at the United Nations – was issued only to raise opium prices and increase profit from the sale of large existing stockpiles. 1999 had yielded a record crop and had been followed by a lower but still large 2000 harvest. The trafficking of accumulated stocks continued in 2000 and 2001. In 2002, the UN mentioned the "existence of significant stocks of opiated accumulated during previous years of bumper harvests". 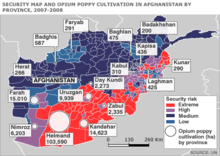 In September 2001 – before 11 September attacks against the U.S. – the Taliban allegedly authorized Afghan peasants to sow opium again. As of 2017, the Afghan government has cooperated with Taliban forces to provide education services: in Khogyani District, the government is given "nominal control" by local Taliban fighters in return for paying the wages of teachers whom the Taliban appoint in local schools. While the Taliban have typically opposed girls' education, in 2017 in Khogyani District it has allowed girls to receive education in order to improve its standing among local residents. War crimes (a serious violation of the laws and customs of war giving rise to individual criminal responsibility) have been committed by both sides including civilian massacres, bombings of civilian targets, terrorism, use of torture and the murder of prisoners of war. Additional common crimes include theft, arson, and the destruction of property not warranted by military necessity. In 2011, The New York Times reported that the Taliban was responsible for ​3⁄4 of all civilian deaths in the war in Afghanistan. In 2013 the UN stated that the Taliban had been placing bombs along transit routes. In December 2001, the Dasht-i-Leili massacre took place, where between 250 and 3,000 Taliban fighters who had surrendered, were shot and/or suffocated to death in metal truck containers during transportation by Northern Alliance forces. Reports place U.S. ground troops at the scene. The Irish documentary Afghan Massacre: The Convoy of Death investigated these allegations and claimed that mass graves of thousands of victims were found by UN investigators and that the U.S. blocked investigations into the incident. On 21 June 2003, David Passaro, a CIA contractor and former United States Army Ranger, killed Abdul Wali, a prisoner at a U.S. base 16 km (10 mi) south of Asadabad, in Kunar Province. Passaro was found guilty of one count of felony assault with a dangerous weapon and three counts of misdemeanor assault. On 10 August 2009, he was sentenced to 8 years and 4 months in prison. A British Royal Marine Sergeant, identified as Sergeant Alexander Blackman from Taunton, Somerset, was convicted at court martial in Wiltshire of the murder of an unarmed, reportedly wounded, Afghan fighter in Helmand Province in September 2011. In 2013, he received a life sentence from the court martial in Bulford, Wiltshire, and was dismissed with disgrace from the Royal Marines. In 2017, after appeal to the Court Martial Appeal Court (CMAC), his conviction was lessened to manslaughter on the grounds of diminished responsibility and the sentence was reduced to seven years effectively releasing Blackman due to time served. On 11 March 2012, the Kandahar massacre occurred when sixteen civilians were killed and six wounded in the Panjwayi District of Kandahar Province, Afghanistan. Nine of the victims were children, and eleven of the dead were from the same family. United States Army Staff Sergeant Robert Bales was taken into custody and charged with sixteen counts of premeditated murder. After pleading guilty to sixteen counts of premeditated murder, Bales was sentenced to life in prison without parole and dishonorably discharged from the United States Army. On 3 October 2015, the USAF attacked a hospital operated by Doctors Without Borders in Kunduz. 42 people were killed and over 30 were injured in the airstrike. The attack was labelled by the United Nations as a 'war crime'. Eleven days after the attack, a U.S. tank made its way into the hospital compound. Doctors Without Borders officials said: "Their unannounced and forced entry damaged property, destroyed potential evidence and caused stress and fear for the MSF team." In November 2014, Amnesty International accused the Pentagon of covering up evidence related to war crimes, torture and unlawful killings in Afghanistan. In September 2018, the United States threatened to arrest and impose sanctions on International Criminal Court judges and other officials if they tried to charge any U.S. soldier who served in Afghanistan with war crimes. The U.S. further claimed that they would not cooperate in any way with the International Criminal Court in the Hague if it carries out a prospective investigation into allegations of war crimes by U.S. military and intelligence personnel in Afghanistan. On 12 April 2019 a panel of ICC judges decided that they would not open an investigation in Afghanistan. The Court's chief prosecutor Fatou Bensouda provided a report that established "a reasonable basis" that crimes had been committed, but they decided against continuing because the U.S. and other parties would not cooperate. 30 November 2018, the BBC, citing the U.N., reported as many as 23 civilians were killed, with most of the victims being women and children, in a U.S. airstrike. The U.N. reported 649 civilian deaths were recorded between 1 January and 30 September 2018 from aerial operations, which is more than has been recorded over every year since the UNAMA began systematically documenting civilian casualties in 2009. The cost of the war reportedly was a major factor as U.S. officials considered drawing down troops in 2011. A March 2011 Congressional Research Service report noted, 1) following the Afghanistan surge announcement in 2009, Defense Department spending on Afghanistan increased by 50%, going from $4.4 billion to $6.7 billion a month. During that time, troop strength increased from 44,000 to 84,000, and was expected to be at 102,000 for fiscal year 2011; 2) The total cost from inception to the fiscal year 2011 was expected to be $468 billion. The estimate for the cost of deploying one U.S. soldier in Afghanistan is over U.S.$1 million a year. According to "Investment in Blood", a book by Frank Ledwidge, summations for the UK contribution to the war in Afghanistan came to £37bn ($56.46 billion). In 2011, the independent Commission on Wartime Contracting reported to Congress that, during the previous decade in Iraq and Afghanistan, the United States had lost between $31 and $60 billion to waste and fraud and that this amount may continue to increase. In the summer of 2013, preparing for withdrawal the following year, the U.S. military destroyed over 77,000 metric tons of equipment and vehicles worth over $7 billion that could not be shipped back to the United States. Some was sold to Afghans as scrap metal. In 2013, the Special Inspector General for Afghanistan Reconstruction, a U.S. government oversight body, criticized the misuse or waste of hundreds of millions of dollars in U.S. aid, including the $772 million purchase of aircraft for the Afghan military especially since "the Afghans lack the capacity to operate and maintain them." In a 2008 interview, the then-head U.S. Central Command General David H. Petraeus, insisted that the Taliban were gaining strength. He cited a recent increase in attacks in Afghanistan and in neighboring Pakistan. Petraeus insisted that the problems in Afghanistan were more complicated than the ones he had faced in Iraq during his tour and required removing widespread sanctuaries and strongholds. In 2009, Afghanistan moved three places in Transparency International's annual index of corruption, becoming the world's second most-corrupt country just ahead of Somalia. In the same month, Malalai Joya, a former member of the Afghan Parliament and the author of "Raising My Voice", expressed opposition to an expansion of the U.S. military presence and her concerns about the future. "Eight years ago, the U.S. and NATO—under the banner of women's rights, human rights, and democracy—occupied my country and pushed us from the frying pan into the fire. Eight years is enough to know better about the corrupt, mafia system of President Hamid Karzai. My people are crushed between two powerful enemies. From the sky, occupation forces bomb and kill civilians … and on the ground, the Taliban and warlords continue their crimes. It is better that they leave my country; my people are that fed up. Occupation will never bring liberation, and it is impossible to bring democracy by war." The Afghan Army was plagued by inefficiency and endemic corruption. U.S. training efforts were drastically slowed by the problems. U.S. trainers reported missing vehicles, weapons and other military equipment, and outright theft of fuel. Death threats were leveled against U.S. officers who tried to stop Afghan soldiers from stealing. Afghan soldiers often snipped the command wires of IEDs instead of marking them and waiting for U.S. forces to come to detonate them. This allowed insurgents to return and reconnect them. U.S. trainers frequently removed the cell phones of Afghan soldiers hours before a mission for fear that the operation would be compromised. American trainers often spent large amounts of time verifying that Afghan rosters were accurate—that they are not padded with "ghosts" being "paid" by Afghan commanders who stole the wages. In early 2015, Philip Munch of the Afghanistan Analysts' Network wrote that '..the available evidence suggests that many senior ANSF members, in particular, use their positions to enrich themselves. Within the ANSF there are also strong external loyalties to factions who themselves compete for influence and access to resources. All this means that the ANSF may not work as they officially should. Rather it appears that the political economy of the ANSF prevents them from working like modern organisations – the very prerequisite' of the Resolute Support Mission. Formal and informal income, Munch said, which can be generated through state positions, is rent-seeking – income without a corresponding investment of labour or capital. 'Reportedly, ANA appointees also often maintain clients, so that patron-client networks, structured into competing factions, can be traced within the ANA down to the lowest levels. ... There is evidence that Afghan officers and officials, especially in the higher echelons, appropriate large parts of the vast resource flows which are directed by international donors into the ANA. Special Inspector General for Afghanistan Reconstruction has reported that roughly half of Afghan soldiers brought to the United States for training go absent without leave which may inhibit the operational readiness of their units back in Afghanistan, negatively impact the morale of other trainees and home units and pose security risks to the United States. The armed opposition or anti-government elements – some Western news media tend to address them all simply as "Taliban" – have from 2008 into 2009 shifted their tactics from frontal attacks on pro-government forces to guerrilla type activities, including suicide, car and road side bombs (IEDs), and targeted assassinations, said a UNAMA report in July 2009. Mr. Maley, an Afghanistan expert at the Australian National University, stated in 2009 that IEDs had become Taliban's weapon of choice. In 2008–2009, according to the Christian Science Monitor, 16 improvised explosive devices (IEDs) were planted in girls' schools in Afghanistan, but there's no certainty who did that. Like Hamas in Gaza, the Taliban in southern Afghanistan are masters at shielding themselves behind the civilian population and then melting in among them for protection. Women and children are trained and equipped to fight, collect intelligence, and ferry arms and ammunition between battles. Female suicide bombers are increasingly common. The use of women to shield gunmen as they engage NATO forces is now so normal it is deemed barely worthy of comment. Schools and houses are routinely booby-trapped. Snipers shelter in houses deliberately filled with women and children. A 2006 WPO opinion poll found that the majority of Afghans endorsed America's military presence, with 83% of Afghans stating that they had a favorable view of the U.S. military forces in their country. Only 17% gave an unfavorable view. The majority of Afghans, among all ethnic groups including Pashtuns, stated that the overthrowing of the Taliban was a good thing. 82% of Afghans as a whole and 71% of those living in the war zone held this anti-Taliban view. The Afghan population gave the U.S.A one of its most favorable ratings in the world. A solid majority (81%) of Afghans stated that they held a favorable view of the U.S.A. However, the majority of Afghans (especially those in the war zone) held negative views on Pakistan and most Afghans also stated that they believe that the Pakistani government was allowing the Taliban to operate from its soil. Polls of Afghans displayed strong opposition to the Taliban and significant support of the U.S. military presence. However, the idea of permanent U.S. military bases was not popular in 2005. According to a May 2009 BBC poll, 69% of Afghans surveyed thought it was at least mostly good that the U.S. military came in to remove the Taliban—a decrease from 87% of Afghans surveyed in 2005. Twenty-four percent thought it was mostly or very bad—up from 9% in 2005. The poll indicated that 63% of Afghans were at least somewhat supportive of a U.S. military presence in the country—down from 78% in 2005. Just 18% supported increasing the U.S. military's presence, while 44% favored reducing it. Ninety percent of Afghans surveyed opposed the Taliban, including 70% who were strongly opposed. By an 82%–4% margin, people said they preferred the current government to Taliban rule. A 2015 survey by Langer Research Associates found that 77% of Afghans support the presence of U.S. forces; 67% also support the presence of NATO forces. Despite the problems in the country, 80% of Afghans still held the view that it was a good thing for the United States to overthrow the Taliban in 2001. More Afghans blame the Taliban or al-Qaeda for the country's violence (53%) than those who blame the U.S.A (12%). A 47-nation global survey of public opinion conducted in June 2007 by the Pew Global Attitudes Project found considerable opposition to the NATO military operations in Afghanistan. Only Israel and Kenya citizens were in favor of the war. On the other hand, in 41 of the 47 countries pluralities wanted NATO troops out of Afghanistan as soon as possible. The authors of the survey mentioned a "global unease with major world powers" and in America that "Afghan War not worth it". In 32 out of 47 countries majorities wanted NATO troops out of Afghanistan as soon as possible. Majorities in 7 out of 12 NATO member countries wanted troops withdrawn as soon as possible. In 2008 there was a strong opposition to war in Afghanistan in 21 of 24 countries surveyed. Only in the U.S. and Great Britain did half the people support the war, with a larger percentage (60%) in Australia. Since then, public opinion in Australia and Britain has shifted, and the majority of Australians and British now also want their troops to be brought home from Afghanistan. Authors of articles on the issue mentioned that "Australians lose faith in Afghan War effort" and "cruel human toll of fight to win Afghan peace". Of the seven NATO countries in the survey, not one showed a majority in favor of keeping NATO troops in Afghanistan – one, the U.S., came close to a majority (50%). Of the other six NATO countries, five had majorities of their population wanting NATO troops removed from Afghanistan as soon as possible. A large-scale 37-nation poll of world opinion carried out by Gallup International in late September 2001 found that large majorities in most countries favored a legal response, in the form of extradition and trial, over a military response to 9/11: only three countries out of the 37 surveyed—the U.S., Israel and India—did majorities favor military action. In the other 34 countries surveyed, the poll found many clear majorities that favored extradition and trial instead of military action: in the United Kingdom (75%), France (67%), Switzerland (87%), Czech Republic (64%), Lithuania (83%), Panama (80%) and Mexico (94%). An Ipsos-Reid poll conducted between November and December 2001 showed that majorities in Canada (66%), France (60%), Germany (60%), Italy (58%), and the UK (65%) approved of U.S. airstrikes while majorities in Argentina (77%), China (52%), South Korea (50%), Spain (52%), and Turkey (70%) opposed them. In a 47-nation June 2007 survey of global public opinion, the Pew Global Attitudes Project found international opposition to the war. Out of the 47 countries surveyed, 4 had a majority that favored keeping foreign troops: the U.S. (50%), Israel (59%), Ghana (50%), and Kenya (60%). In 41, pluralities wanted NATO troops out as soon as possible. In 32 out of 47, clear majorities wanted war over as soon as possible. Majorities in 7 out of 12 NATO member countries said troops should be withdrawn as soon as possible. A 24-nation Pew Global Attitudes survey in June 2008 similarly found that majorities or pluralities in 21 of 24 countries want the U.S. and NATO to remove their troops from Afghanistan as soon as possible. Only in three out of the 24 countries—the U.S. (50%), Australia (60%), and Britain (48%)—did public opinion lean more toward keeping troops there until the situation has stabilized. The Afghanistan Independent Human Rights Commission (AIGRC) called the Taliban's terrorism against the Afghan civilian population a war crime. According to Amnesty International, the Taliban commit war crimes by targeting civilians, including killing teachers, abducting aid workers and burning school buildings. Amnesty International said that up to 756 civilians were killed in 2006 by bombs, mostly on roads or carried by suicide attackers belonging to the Taliban. NATO has alleged that the Taliban have used civilians as human shields. 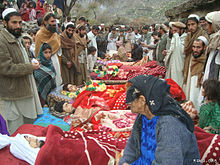 As an example, NATO pointed to the victims of NATO air strikes in Farah province in May 2009, during which the Afghan government claims up to 150 civilians were killed. NATO stated it had evidence the Taliban forced civilians into buildings likely to be targeted by NATO aircraft involved in the battle. A spokesman for the ISAF commander said: "This was a deliberate plan by the Taliban to create a civilian casualty crisis. These were not human shields; these were human sacrifices. We have intelligence that points to this." according to the U.S. State Department, the Taliban committed human rights violations against women in Afghanistan. White phosphorus has been condemned by human rights organizations as cruel and inhumane because it causes severe burns. White phosphorus burns on the bodies of civilians wounded in clashes near Bagram were confirmed. The U.S. claims at least 44 instances in which militants have used white phosphorus in weapons or attacks. In May 2009, the U.S. confirmed that Western military forces in Afghanistan use white phosphorus to illuminate targets or as an incendiary to destroy bunkers and enemy equipment. U.S. forces used white phosphorus to screen a retreat in the Battle of Ganjgal when regular smoke munitions were not available. Afghan refugees in Iran, for example, were not allowed attend public schools, "faced with restrictions on property ownership, freedom of movement, and access to government services...bullying, and physical abuse accompany many Afghan children throughout their adolescence...whether playing at recess or standing in line for bread at the naanvai, they hear jeers like 'Go back to your country,' and 'Dirty Afghan' daily", denied participation in any form of elections, and legally restricted to take a handful of minimum paid jobs, and frequent target of scapegoating. For the price of citizenship for their family members, Afghan children as young as 14 were recruited to fight in Iraq and Syria for a six-month tour. Afghan refugees were regularly denied visa to travel between countries to visit their family members, faced long delays (usually a few years) in processing of their visa applications to visit family members for purposes such as weddings, gravely ill family member, burial ceremonies, and university graduation ceremonies; potentially violating rights including free movement, right to family life and the right to an effective remedy. Racism, low wage jobs including below minimum wage jobs, lower than inflation rate salary increases, were commonly practiced in Europe and the Americas. Many Afghan refugees were not permitted to visit their family members for a decade or two. Studies have shown abnormally high mental health issues and suicide rates among Afghan refugees and their children living in the west. ^ Felbab-Brown, V (2012). "Slip-Sliding on a Yellow Brick Road: Stabilization Efforts in Afghanistan". Stability: International Journal of Security and Development. 1 (1): 4–19. doi:10.5334/sta.af. ^ Inter Press Service, 3 May 2011, "U.S. Refusal of 2001 Taliban Offer Gave bin Laden a Free Pass"
^ Knight, Peter (2008). "Outrageous Conspiracy Theories: Popular and Official Responses to 9/11 in Germany and the United States". New German Critique. 35: 165–93&#91, clarification needed&#93, . doi:10.1215/0094033X-2007-024. ^ ISAF Spokesman Discusses Progress in Afghanistan Archived 3 March 2013 at the Wayback Machine. International Security Assistance Force/NATO. 25 July 2011. ^ Nejad, RM; Klöhn-Saghatolislam, F; Hasan, A; Pogarell, O (May 2017). "[Mental disorders and problems in afghan refugees: The clinical perspective]". MMW Fortschritte der Medizin. 159 (9): 64–66. doi:10.1007/s15006-017-9653-y. PMID 28509013. ^ Slewa-Younan, Shameran; Yaser, Anisa; Guajardo, Maria Gabriela Uribe; Mannan, Haider; Smith, Caroline A.; Mond, Jonathan M. (24 August 2017). "The mental health and help-seeking behaviour of resettled Afghan refugees in Australia". International Journal of Mental Health Systems. 11 (1). doi:10.1186/s13033-017-0157-z. ^ Yaser, Anisa; Slewa-Younan, Shameran; Smith, Caroline A.; Olson, Rebecca E.; Guajardo, Maria Gabriela Uribe; Mond, Jonathan (12 April 2016). "Beliefs and knowledge about post-traumatic stress disorder amongst resettled Afghan refugees in Australia". International Journal of Mental Health Systems. 10 (1): 31. doi:10.1186/s13033-016-0065-7. ISSN 1752-4458. PMC 4828823. ^ Stempel, Carl; Sami, Nilofar; Koga, Patrick Marius; Alemi, Qais; Smith, Valerie; Shirazi, Aida (28 December 2016). "Gendered Sources of Distress and Resilience among Afghan Refugees in Northern California: A Cross-Sectional Study". International Journal of Environmental Research and Public Health. 14 (1): 25. doi:10.3390/ijerph14010025.